Ghostery's TrackerMap displays tracking activity on a single page of each publisher's site. That's according to Ghostery, which on Tuesday announced a partnership with Oracle whereby its TrackerMap Live monitoring tool is now available to users of the Oracle Marketing Cloud. 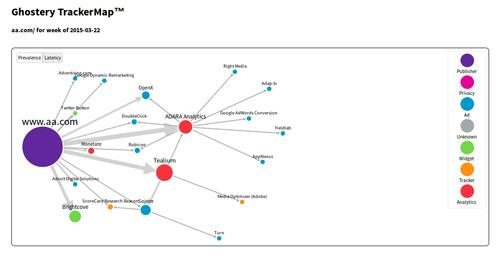 Offered on the Oracle Marketing AppCloud, TrackerMap Live is designed to help reveal the interconnected ecosystem of code and third-party tags on company websites. Using TrackerMap Live, companies can pinpoint where each tag on their site comes from and see what its effects are. Along the way, they can determine whether vendors are placing unwanted or non-secure piggyback tags on their website without permission. By providing a clear map that shows each tag on a site, the tool also makes it easier to audit the code with a neutral third-party vendor. Marketers can use it to identify data leakage as a result of third-party code and ensure that customer data remains safe. Finally, TrackerMap Live can scan any page across the Web, so companies can use it not just on their own pages, but on those of their competitors. The result can be competitive intelligence such as insight into which vendors those competitors are working with -- information that businesses can use to formulate better digital marketing strategies, Ghostery said. The tool is built into the Oracle Data Management Platform and can be used immediately with no extra charge.